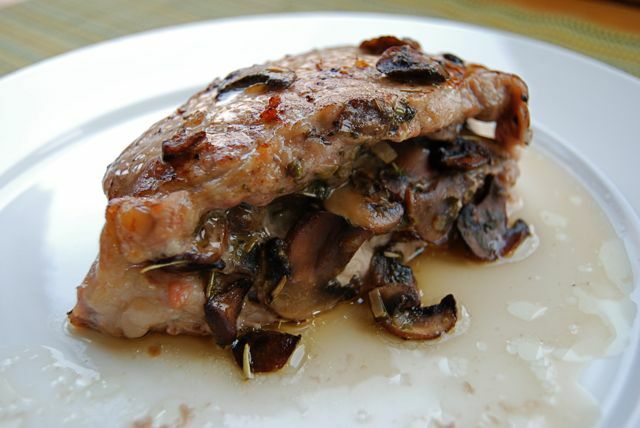 Thick, meaty chops filled with seasoned mushrooms and shallot. Absolutely scrumptious! This delicious (and incredibly low sodium) recipe comes from the No-Salt Cookbook by David and Thomas Anderson. Heat a skillet over medium. Add butter and shallot and cook, stirring, 5 minutes. Add the mushroms and black pepper and cook, stirring, 10 minutes. Add broth and stir well to deglaze pan. Add parsley and rosemary. Turn up the heat and reduce liquid until pan is almost dry. Remove mushroom mixture to a plate or bowl and set aside. Preheat oven to 350 degrees. Wash the pork chops and pat dry. Use a sharp knife to slice sideways into each pork chop to create a pocket. Fill the pockets with the mushroom mixture. Heat olive oil in the skillet over medium-high. Add chops to the pan, 2 at a time, and sear on both sides. Remove chops and place in a baking dish. Place pan on middle rack in oven and bake until cooked through, 20-30 minutes. Remove from oven and serve immediately. Hi can you please also say which items you are using like exactly what broth? Id like to mirror your sodium content. Thank you! I don’t tend to specify brands unless the sodium content is very specific. In the case of low sodium broth, most commercial brands range around 140 mg per cup, so I’d suggest just picking one as close to that as possible. If you’re looking for a particular brand that I do use and like, I’d suggest Pacific Organic low sodium broths. All of them (chicken, beef, and vegetable) are excellent. Hope that helps!